Today's modern wireless mobile communications depend on adaptive "smart" antennas to provide maximum range and clarity. With the recent explosive growth of wireless applications, smart antenna technology has achieved widespread commercial and military applications. 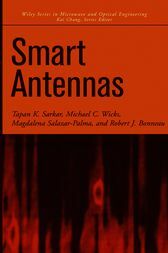 The only book available on the topic of adaptive antennas using digital technology, this text reflects the latest developments in smart antenna technology and offers timely information on fundamentals, as well as new adaptive techniques developed by the authors. Coupling electromagnetic aspects of antenna design with signal processing techniques designed to promote accurate and efficient information exchange, the text presents various mechanisms for characterizing signal-path loss associated with signal propagation, particularly for mobile wireless communications systems based on such techniques as joint space-frequency adaptive processing. The text is an excellent resource for researchers and engineers working in electromagnetics and signal processing who deal with performance improvement of adaptive techniques, as well as those who are concerned with the characterization of propagation channels and applications of airborne phased arrays. TAPAN K. SARKAR, PhD, received a BTech from the Indian Institute of Technology, Kharagpur, India, an MScE from the University of New Brunswick, Fredericton, Canada, and an MS and a PhD from Syracuse University in Syracuse, New York, where he is currently a professor in the Department of Electrical and Computer Engineering. He is a fellow of the IEEE. MICHAEL C. WICKS, PhD, received undergraduate degrees from Mohawk Valley Community College and Rensselaer Polytechnic Institute, and graduate degrees from Syracuse University, all in electrical engineering. He is a Fellow of the IEEE and a member of the Association of Old Crows. Dr. Wicks is a Principal Research Engineer in the U.S. Air Force Research Laboratory in the Sensor Directorate, Radar Signal Processing Branch. He has authored over 125 papers, reports, and patents. MAGDALENA SALAZAR-PALMA, PhD, received an Ingeniero de Telecomunicación and a PhD from the Universidad Politécnica de Madrid in Madrid, Spain, where she is a Profesor Titular in the Signals, Systems, and Radiocommunications Department at the Escuela Técnica Superiór de Ingenieros de Telecomunicación. ROBERT J. BONNEAU, PhD, obtained his BSEE and MSEE from Cornell University and his MS and PhD from Columbia University, all in electrical engineering. He is the program manager at the Advanced Technology Office of DARPA.